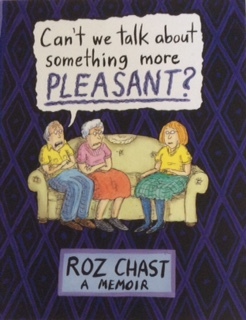 I’ll admit at the outset that I’m a long-time admirer of Roz Chast. Her mix of humor and humanity appeals to me, as to her millions of fans from The New Yorker and/or her books. I wouldn’t say that I’m necessarily a fan of graphic novels, although I’ve read a few and admire the ability to both draw and tell a story. When this book first appeared on the scene, I have to say I resisted it, primarily because I feared it would hit too close to home. I wasn’t anxious to relive the last few years of my parents’ lives, and I feared the book would be a real downer. As they say – oh ye of little faith. I should have known that Chast would bring her reliably honest, yet compassionate, eye to this topic. When it was a finalist for The National Book Award, I began to soften. When my husband gave me a generous gift certificate for Vroman’s Bookstore in Pasadena, and I wanted to put it toward something I would never put on my Kindle, I took the chance and bought Can’t We Talk. Smart move. Chast goes step-by-step through the process of dealing with aging parents – the initial denial that they aren’t as with-it as they used to be, the slow realization that it’s time for you, the child, to begin (reluctantly) to pay more attention. During this period, you recall all their idiosyncrasies, which are now being played out in HD. Eventually, the crisis – one or the other dies, falls, becomes ill. The equilibrium is shifted and you are now parenting the parent. The seesaw between impatience and guilt. The expense. The resentment. The fear. I know – this all sounds like a real downer, but Chast’s humorous drawings, the frank honesty, and the intense intimacy with which she shares her experience had the final result of freeing me from some of the guilt and remorse that has stayed with me since my own parents’ deaths. It was, if you will, cathartic to read how many similarities we had in our experiences. If, like me, you have shied away from this warm, humorous, human book I am here to tell you, fear not. You will cry, you will laugh, and you will finish Can’t We Talk knowing that there is at least one person out there who has seen what’s in your heart. I want to find this book – to laugh a little, reminisce a little – and then pass it on to my daughter – so she’ll know what to expect. Thanks for the review.